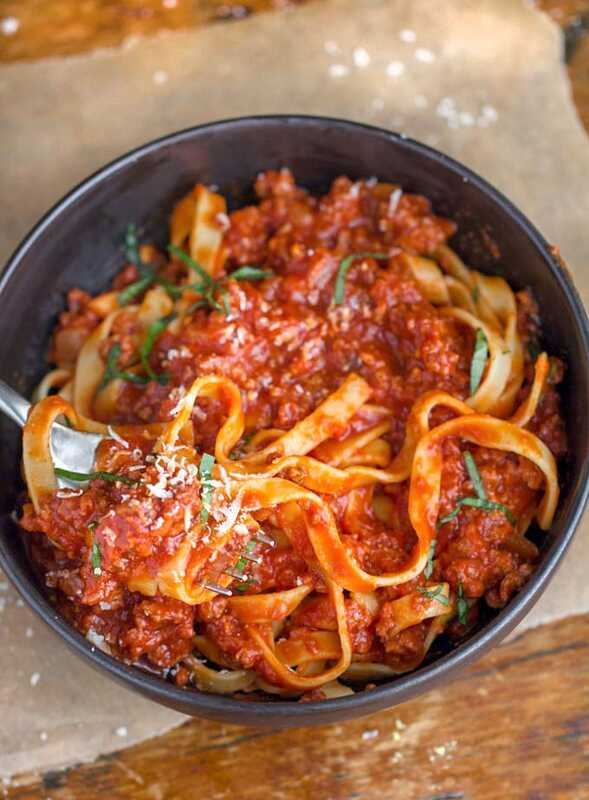 Quick Turkey Ragu: an easy recipe for rich tomatoey Italian meat sauce, made with ground turkey. Does anyone else eat meat sauce with a spoon? (standing in front of the fridge, cold, out of the pot…?) A good Italian meat sauce is totally irresistible to me. 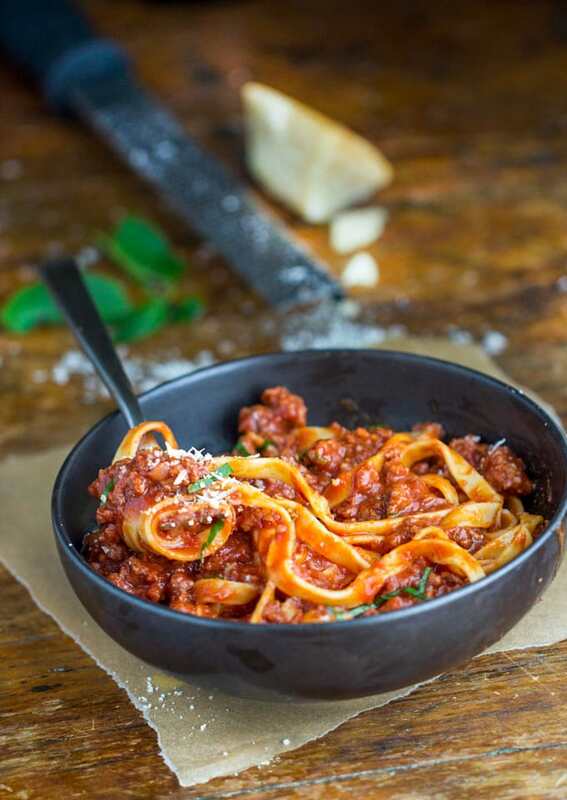 Nothing excites the dinner table quite like rich, silky ragu alla bolognese over pasta. It’s the star of Italian meat sauces and, in my opinion, one of the world’s most delicious dishes. But have you ever tried cooking bolognese from scratch? It requires several stages of preparation and 3 or more hours of simmering. It also packs a good amount of fat and calories. Don’t get me wrong. 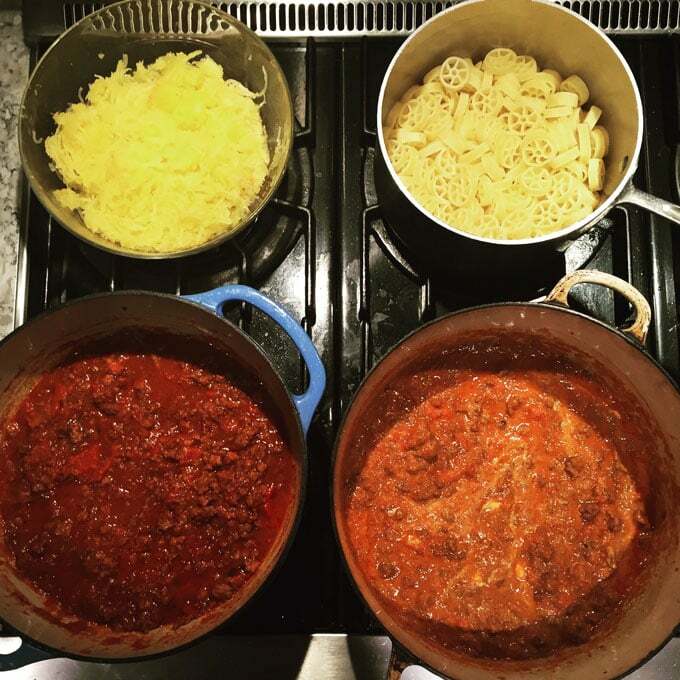 I think it’s totally worth the the time and effort (and calories) to cook authentic ragu alla bolognese for a special occasion. But for those of us who crave delicious ragu often and always, there has to be another way. 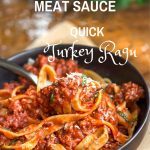 So here you go – a quick turkey ragu recipe, healthy enough and easy enough for weeknight dinner, delicious enough for any occasion. This recipe starts with a simple, 4-ingredient tomato sauce or, to make it even faster, use your favorite store-bought marinara. Ground turkey doesn’t have a ton of flavor on its own. But after it simmers with shallots and garlic and wine-scented tomato sauce, it’s so rich and tasty, you might even forget it’s turkey and think you’re eating ‘beefy’ meat sauce. While the tomato sauce is simmering, sauté the ground turkey with shallots and more garlic in a skillet. Add the wine and cook for 5 minutes to reduce the wine and intensify the flavors. Combine the turkey-wine mixture with the tomato sauce. Cook for another 10 minutes and voila! There are many options for how to serve turkey ragu, depending on your mood or dietary preferences. Go traditional and serve it over your favorite pasta. If you prefer to dine gluten-free, turkey ragu is delicious with spaghetti squash or zoodles. While we’re on the topic of delicious, healthier recipes made with ground turkey, here are a few more great ones: Italian Style Turkey Meatballs. (the secret ingredient is grated sweet potato), Sicilian Turkey Meatloaf (mixed with mashed potatoes instead of bread crumbs), Turkey Zucchini Meatballs (with Lemony Yogurt Sauce, from chef Ottolenghi), and Turkey Falafel Meatballs (with Lemon Yogurt Sauce. And now here’s the recipe for quick turkey ragu. As always, I’m hoping that if you cook this, you’ll come back to leave a comment and let me know what you think. 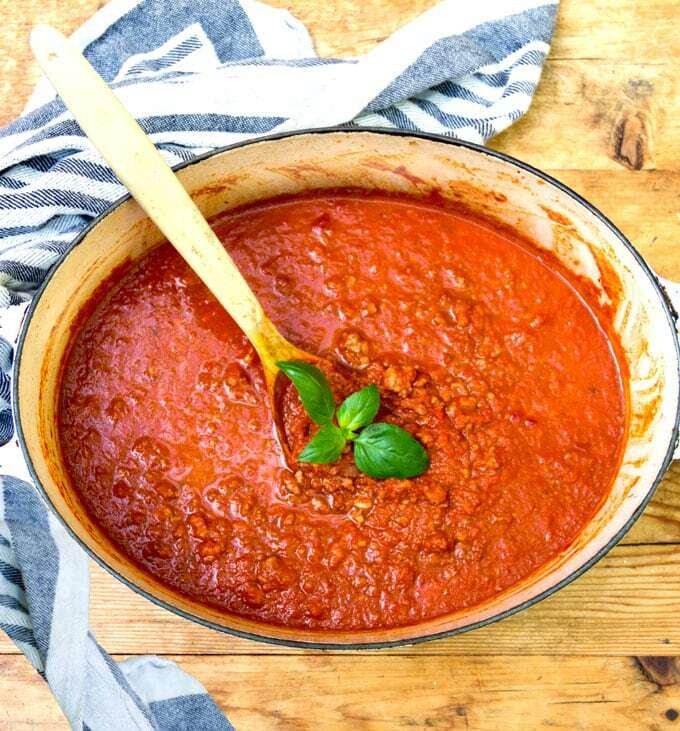 A quick, healthy, delicious turkey meat sauce to serve over pasta, spaghetti squash or zoodles. 1 cup of good dry red wine. Good choices are: Cabernet Sauvignon, Merlot, Pinot Noir, Shiraz, or Zinfandel. Make The Tomato Sauce (or skip this step if using store-bought marinara sauce): Heat 1/4 cup oil over medium heat, in a heavy pot or Dutch oven, with a lid. Add onions and red pepper. Cook for 2 minutes, to soften the onions. Add 1 tablespoon garlic and cook, stirring, for 1 minute, until fragrant (don’t let it brown). Add tomato puree, tomato paste, water and 1/2 teaspoon of salt. Stir to combine. Bring to a boil and immediately lower to a gentle simmer. Partially cover the pot to prevent sputtering. Simmer sauce for 10 minutes. Remove from heat. Make The Turkey Ragu: Heat 2 tablespoons olive oil in a large cast iron or non-stick skillet or heavy sauce pan, over medium heat. Add chopped shallots. Sauté, stirring often, for 3 minutes. Add 1 tablespoon of chopped garlic and sauté, stirring, for 30 seconds, until fragrant. Add the turkey and 1 teaspoon of salt. Cook, stirring and breaking up the meat with a wooden spoon, until the turkey has lost all of it’s pink color. If there’s lots of liquid in the pot, cook for an additional minute to evaporate some of the liquid. Pour in the wine and simmer on medium-low for 5 minutes, until the wine is reduced by about half. Pour in 4 cups of marinara sauce or homemade tomato sauce. Bring to a boil. Lower to a simmer. Cook the meat sauce, partially covered, for 10 minutes to combine flavors. To Serve: Serve sauce over pasta, spaghetti squash, or zoodles. For a richer, creamier consistency, stir 1/2 cup of ricotta cheese into the sauce before serving. Garnish with freshly grated parmesan cheese and slivered basil. This recipe was first published on July 27, 2016. Updated on August 6th, 2018. It’s the same delicious recipe with added nutritional information and a few tweaks to make the recipe easier to follow. One of my inspirations for this recipe is Giada’s delicious recipe for lamb ragu with mint. 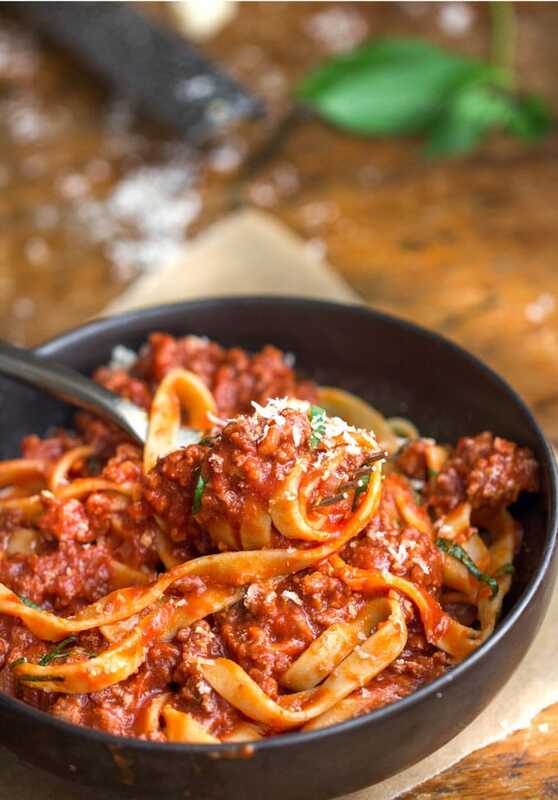 If you’re a fan of ragu, here’s another light and delicious ragu recipe from Cooking Light that you can make it your slow cooker. This sauce has such great flavor and comes together so fast. Great for a weeknight dinner. This is a great meat sauce! I love your sloppy giuseeppe concept Alex. Can’t wait to give it a try. Thanks for your comment! Made this the other night! One of my favorite dishes. Super easy, and a total crowd pleaser!!! I’m so glad you enjoyed! Thanks for cooking with Panning The Globe and for coming back to let me know what you think. Do you have any nutritional values on this please? My husband is following an extremely low fat regime for health reasons and I’m looking for tasty, satisfying meals very low in fat. Hi Karen, at this time I don’t do nutritional calculations for my recipes, though it’s something I’ve been considering doing. There are some good tools out there to help you calculate, such as My Fitness Pal http://www.myfitnesspal.com/recipe/calculator – Here’s what I know: This turkey ragu is low in fat and you can make it extremely low in fat by using only extra lean white meat turkey (99% fat free) and by reducing the amount of olive oil. Right now there are 6 tablespoons of olive oil in the recipe, which is about 80 grams of fat. Divide that by five servings and you get 16 grams of fat per serving. You can cut that down to 8g/serving by only using three tbs of oil or less by using only two TBS. The extra lean turkey is about 2g of fat per serving, which would bring you to 10g of fat per serving of sauce, or less if you only use 2 TBS olive oil. The other ingredients – sauce, onions, garlic, wine – don’t have significant amounts of fat. I hope this helps! I wanted a quick, diet friendly turkey sauce. This was perfect. I chopped everything in the food processor and I don’t think I diminished the final product. I just ate a small bowl without pasta because it’s nearly time for bed. It’s so good I don’t think I’ll even add pasta! Can’t wait to try with eggs and maybe eggplant! This dish is by far the most delicious thing I have ever tasted. Its also simple to make and holds up very well in the fridge! 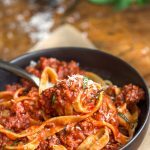 I adore bolognese sauce, but I’ll admit that sometimes I’m not up for all that beef – this is the perfect option for having my pasta sauce and eating it too. 🙂 Even with the weather at 90 degrees right now, your photos make me yearn for a big bowl of this turkey ragu/bolognese. This sounds great, and I like the idea of serving it with some ricotta on top–I’ve never heard of that and I bet it’s gooood! I am guilty as charged, right out of the pot, spoon in hand. I sneak it.